Though Rangoon’s Hlaing Tharyar Township was pegged a likely candidate for mass disenfranchisement, the situation doesn’t appear to have played out as some had expected. HLAING THARYAR TOWNSHIP, Rangoon Division — Squatters living near the Shwelinpan bridge in the eponymous quarter of Hlaing Tharyar Township said they received an unexpected gift on Saturday: voter identification cards from a local administrator, granting them 11th-hour suffrage ahead of Burma’s general election on Sunday. Though Hlaing Tharyar Township has been pegged a likely candidate for mass disenfranchisement, a visit by The Irrawaddy on Sunday morning did not find the situation playing out as some had expected in the densely populated industrial hub, where many internal migrants have taken up residence after moving to the commercial capital in search of work. A lack of household registration certificates, combined with the fact that many of these migrants don’t hold national identity cards, has meant that large swaths of this industrial hub had appeared at risk of losing the right to vote this month. But in conversations on Sunday with local temporary residents, efforts to grant the internal migrant population here voting rights appear to have paid off, with local election officials saying they expected significant turnout from the contingent on Sunday. Thin Thin Thar was also among those receiving voter identification cards just ahead of the election, and while she conceded that she was not well-versed in politics, she is testament to the widespread appeal of opposition leader Aung San Suu Kyi and her National League for Democracy (NLD). All Thin Thin Thar needed to do was see the fighting peacock and lone yellow star to know where to stamp her ballot on Sunday. “I love her [Suu Kyi] but don’t have any big hopes from her,” she said. If the small sampling of voters interviewed by The Irrawaddy is representative of the larger contingent of tens of thousands of squatters living here, it would appear that the NLD won the blue collar vote on Sunday. According to the Shwelinpan quarter subcommission head Moe Kyaw, 12 polling stations were set up to field some 13,000 eligible voters in the quarter, of which more than one-third, between 4,000-5,000 people, were squatters who had managed to secure voting eligibility. About 9,000 ballots had been cast as of 4 pm, when polling stations officially closed nationwide, with more than 100 people still waiting in line to vote. But efforts to update the voter rolls to reflect the fluidity of Hlaing Tharyar’s population were not a complete success, Moe Kyaw conceded. “Some of them [squatters] have gone back to vote their native [hometowns] and I think about 500 squatters haven’t got voter IDs,” he said. Voters who were able to prove residency of six months or more could apply to vote in the constituency in which they are resident, or else would in most cases need to return to the constituency in which they are listed on a household registry. 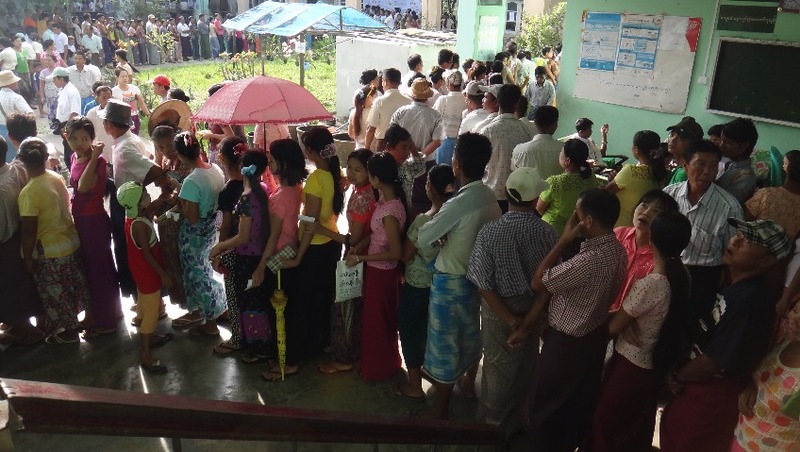 Hundreds of voters queue in Rangoon Division’s Hlaing Tharyar Township on Sunday. Nai Win Maung, a 42-year-old squatter, said he had cast an advance vote in his native town Maubin, in Irrawaddy Division, three days ahead of the nationwide vote. “As I understood it, our household registrations were invalid here and I could not apply to vote, but I have heard that some of us [squatters] got it,” he said. Elsewhere in Hlaing Thayar, a polling station in the township’s quarter No. 15 was girding for up to 16,000 voters to pass through the doors of a local middle school. Among that list, internal migrants numbered some 6,000 people, according to local NLD chapter head Zaw Zaw Tun, who cited data compiled by the party. The quarter No. 15 subcommissioner Aye Kyway was not able to provide an accurate figure on the squatter population. In June, the Rangoon Division subcommission chief Ko Ko estimated that up to 100,000 people in the township who had not been issued household registration certificates might be ineligible to cast a ballot, but at the time he pledged to do his best to arrange voting rights for squatters. The subcommission chairman said no up-to-date list of squatter populations in Rangoon existed, but he estimated that a township like Hlaing Tharyar had an unregistered migrant population of at least 30,000. In Rangoon Division, which the 2014 census found to have a population of nearly 7.4 million, Ko Ko said the total squatter population was likely more than 100,000 people. Other estimates put the figure much higher, with the transient nature of these populations making it difficult to ascertain an accurate picture. Hlaing Tharyar Township is Burma’s most populous, according to the census, which recorded nearly 690,000 people residing in the township last year. The NLD’s candidates for Parliament’s Upper and Lower houses representing Hlaing Tharyar are Aye Bo and Dr. Than Myint, respectively. They are competing against Tin Yu and Nyan Win, as well as candidates from 12 other parties. The Rangoon Division subcommission head Ko Ko and his township-level equivalent in Hlaing Thayar could not be reached for comment on Sunday. Top Photo - (Moe Myint / The Irrawaddy ) A woman looks at a ballot for candidates contesting Rangoon’s Hlaing Tharyar Township on Sunday.